New improved design, form fitting Extreme Vented Sport Boots, with an even closer contour fit, lightweight, less bulk. Air-flow perforated neoprene to allow the leg to breathe, releasing heat, three strong "quick grip" closures make these boots easy to put on correctly every time. 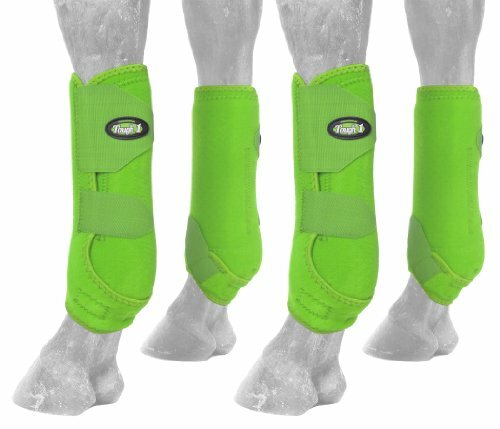 Easy to clean, fits like a second skin to protect your equine athlete while keeping dirt out.NOTE:The ‘L’ on the sport boot is for Large (not left), which leave them to be labeled Large Rear, Large Front with 2 of each type (each front and back should have 2 pieces). These are not all the same sides, as you can see when laid out next to each other they will be opposites (Velcro facing opposite ways). These are labeled this way for barns that may have many different sizes to help match up after storage-these labels are not any correlation to right and left. View More In Boots & Wraps. If you have any questions about this product by Tough 1, contact us by completing and submitting the form below. If you are looking for a specif part number, please include it with your message.